All heroes have both active and passive abilities, namely "Hero Skills" and "Battle Skills". Battle Skills are, as seen in the image below, passive abilities that grant various types of boosts. The Battle Skills are categorized into "Administration" and "Logistics". Administration skills are activated the moment the hero is hired. They do not need to be set as the leader or garrisoned in a wall to activate these skills, hence they are always activated. Administration skills are important as they have a greater effect the longer you play the game. 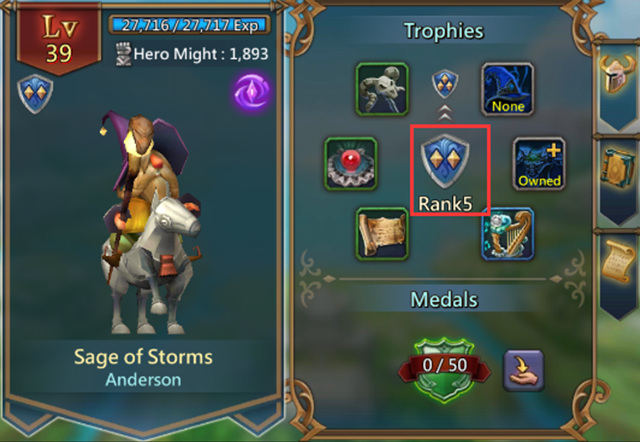 The skills grow in power when you upgrade the hero with medals. There are four skills per hero; the skills are unlocked by fully equipping the hero and raising the rank of the hero. The first skill only activates if the Hero is leading troops into battle. The other three are passive skills, which are further divided into administrative and logistic types. Administrative – Skills grant permanent bonuses. Logistic – Skills grant battle bonuses. Earn the equipment for the heroes by winning hero stages, or opening chests. They should not be confused with the equipment you make from the forge, which is for your leader only and is completely different. 1-20% boost in construction speed (Sage of Storms, Scarlet Bolt) Both heroes are available in normal stages. This affects all new buildings on your turf, as well as upgrading them. This will not affect those already in progress. This affects all new researches in your academy. Most players rush to gather the Golden Trio ( Sage of Storms, Scarlet Bolt, and Trickster) for a quick boost in speed. This affects both F2P players, as well as paid players. There will be more as more heroes are introduced into the game.